Are shampoo bars worth switching to in the name of the environment? Lately, I’ve been seeing more Filipinos going green. 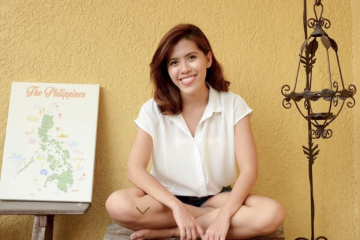 People around the world have been doing their part to reduce their carbon footprint following reports from the United Nations saying we have less than 12 years to reduce our waste, and even Filipinos are doing their part. Simple practices, such as bringing reusable Tupperware to the supermarket, although small, can turn into something bigger if more people are moved to act for the environment. Unfortunately, another thing I observed online is that when something gets trendy, businesses will capitalize on it. And when it comes to environmental matters, it reaches the point when the product defeats its original purpose. Take, for example, reusable straws. Meant to replace one-use plastic straws, it seemed like a good idea at the time. But then it was marketed to make people believe that plastic straws are the bane of landfills – and not the other plastics we carelessly throw – and that people had to buy one set, a rainbow set, and a ~*LiMiTeD eDiTiOn*~ gold matte set to stay on trend (oh, and to save the environment, too). I even saw a photo online showing a metal straw packaged inside a single-use plastic – the irony was not lost on everyone. In fact, now that the market is saturated with metal straws, it’s now creating an impact on the mining sector. So you’ll understand my skepticism when shampoo bars came out and were marketed as the next environmental-friendly trend that got rid of the need for plastic bottles. I was a bit skeptical and thought it would have its 15 minutes of fame before people got tired and went back to regular shampoos. 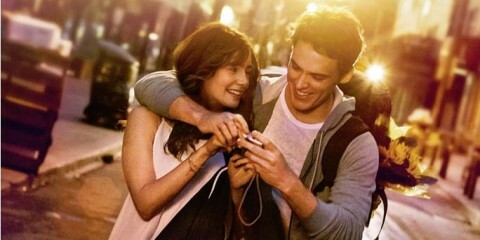 That’s why I’ve decided to try this little experiment. I’ve taken five shampoo bars from five different businesses to see if this was a trend that was not only more environmentally friendly than buying your shampoo and conditioner in a bottle, but was also good for your hair. 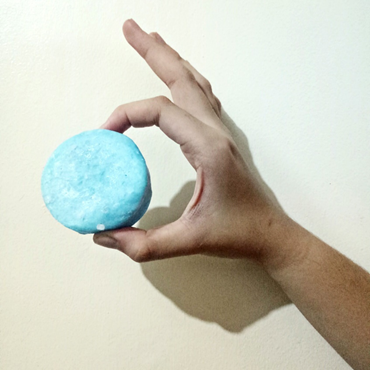 I purchased shampoo bars from four different online stores: three from Shopee, and two (plus a conditioner bar) from an online store endorsed by a friend. I also borrowed one of the shampoo bars from one of our writers, Katrina Tankeh (if you enjoy reading about zero waste and going green, you should check out her articles – she writes a lot of helpful tips). As someone who struggles with wavy, frizzy hair that can easily go from Princess Merida from “Brave” to Rubeus Hagrid with just the slightest humidity change, I’m not only looking for the one with the best scent or the most Insta-worthy color. I’m also looking for how well I can use it and apply it to my hair in the bathroom. By the end of this experiment, I want to know if shampoo bars are worth switching to, or if the little bottles and sachets of shampoo we consume are a necessary sacrifice to keeping a healthy head of hair. If we’re going to talk about vegan shampoo bars, we definitely have to talk about Lush Cosmetics. Credited as the company that made packaging-free beauty products popular, US-based Lush Cosmetics is known for its creative-looking bath and beauty products. As of writing, they have a few stores here in Metro Manila. The last time I went to their store in Greenbelt 3, I was very tempted to buy my own shampoo bar. But the cost of one bar was almost twice the amount I pay for a big bottle of my shampoo. It seems impractical if you’re talking about money. But Lush claims that one bar lasts the same time as two 250 mL bottles of shampoo, or about five months. A large bottle can last me less than a month, so if the reviews are true, then the price may just be worth it. Kat’s bar was called “Karma Komba.” It’s made with Lush’s “signature Karma perfume” and has orange, pine, and patchouli oils. It’s meant for people who want to focus on keeping their scalp healthy and their knotty hair from smoothing out when you brush it. It was the first shampoo bar I got to hold, and I wondered if it would work the same way as soap did. Kat warned me that the shampoo was a bit strong, which is why she doesn’t use her bar every day (perhaps this is why Lush bars last so long?). One sniff of the bar, and I can tell she was right. The scent was good, but I was unfamiliar with it. As this was what set the standard on beauty bars around the world, I decided to try this first. I thought it would act like soap and soften when wet, so I was surprised when, seconds after wetting and giving it a lather, it was still hard but gave me more than enough suds to massage into my hair. The scent was really good, albeit a bit strong as Kat said. I thought I would have to get more suds out of the bar, but there was already so much to work with. But when it came time to rinse the shampoo, my hair felt a bit squeaky and waxy. I don’t know if this means that my hair was squeaky clean or not, but as I ran my hand through my hair, there was a lot of hair fall. After I got out of the shower and dried my hair, though, my hair felt a bit softer. I was really surprised by how much product I got with just a little lather. Despite its price, if it really does live up to Lush’s promise that it will take consumers months to use out their shampoo bars, then not only are these bars good for the environment; they’re also pretty effective in keeping your hair clean and healthy. I’d buy my own shampoo bar from Lush, but maybe in a different scent (and maybe right after payday). I found out about Lingap on Facebook when one of my friends shared their post about their shampoo and conditioner bars. I assume they’re a relatively new business, having just started their page earlier this year. 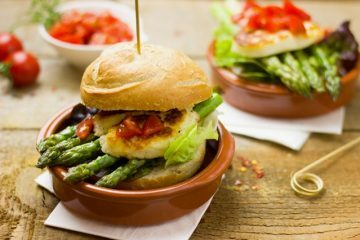 Among their other zero waste products, their shampoo bars were advertised as organic, vegan, and sulfate-free. I decided to buy two small shampoo bars that could help my hair condition Tibay (for hair fall) and Lambot (for dry, frizzy hair) as well as their lavender conditioner bars. 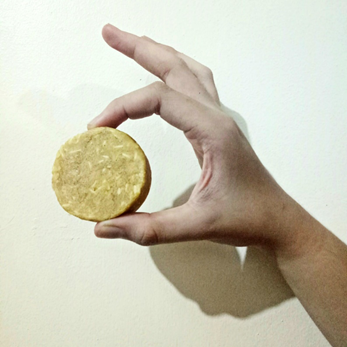 According to Lingap, each shampoo bar is good for up to 60 washes. Out of all the shampoo bars I bought (I didn’t opt to buy a tin can from any of them), Lingap was the only one that provided useful reusable packaging. While others wrapped their shampoo bars in wax paper, Lingap provides each bar with a mesh pouch. After using a shampoo bar, you have to let it dry before storing it, and Lingap provides a convenient package for free. I loved the smell of all the bars I bought. The Tibay bar had a small chip, but this may have been due to delivery. 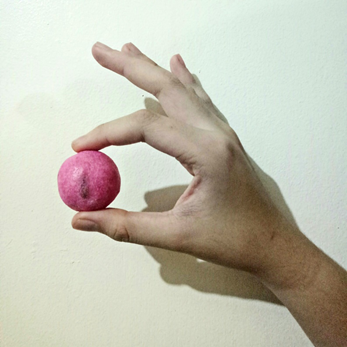 It had a different texture compared to the Lush bar, and I later found out it was because Lush uses sulfates while Lingap is more soap-based. The shampoo bars required a bit more lather than the Lush bar, and I had to rub the bars on my hair to ensure everything had enough suds. Upon washing, however, I liked that there was no waxy feeling on my hair and felt just like my hair normally would with my everyday shampoo. I tried the lavender conditioner bar next. I kind of struggled with this as I didn’t know if I was putting enough conditioner or if it was even transferring to my hair. If you’ve ever hand-washed your own clothes, imagine doing that kind of hand movement, but on your hair. It made me take much longer than I normally would in the bathroom. 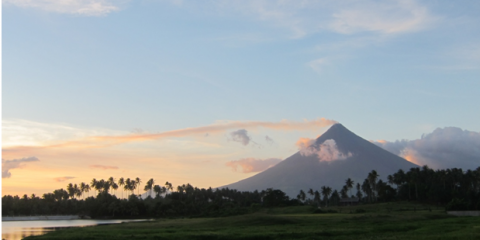 One of Lingap’s strong factors was that, despite several uses, all the bars still maintained their scent. I’m not sure if this was because I bought the small bar, but after about three uses, the shampoo bars grew significantly smaller. Since it has a shorter lifespan than Lush’s shampoo bars, the size shrinks faster (compared to the Lush bar I used, which never changed in size). Despite this, I honestly would buy shampoo bars from Lingap again. But I’m a bit hesitant to switch to conditioner bars if it means spending more time in the bathroom trying to scrub conditioner into my hair. Mike Charlie (mikecharlieph) is a Shopee vendor from Iloilo who claims to provide “earth-friendly products for you that fight against consumerism and single-use packaging.” Apart from reusable utensils, chopsticks, straws, and bamboo toothbrushes, he sells shampoo bars in seven types. It cost P90 per bar, which isn’t a bad deal, given its size. I bought the ocean-scented bar, and I was really impressed with the unique list of scents. Buying the tin can will cost you an extra P50, so I opted for the bare bar option. The seller warned that it would be wrapped in paper if purchased without the tin. Upon opening the courier packaging, I smelled a little bit of the scent that permeated past the white wrapper and paper bag wrapped around it. The scent was so overpowering that it smelled more like an artificial bathroom air freshener than the natural ocean breeze I love to smell during the summer. Even my co-workers thought I sprayed an air freshener. I removed the paper wrapper and a few clear crystals spilled on the desk. I couldn’t really tell what the crystals were (Sea salt? Tawas? We’ll never know. ), so I kept the shampoo bar wrapped in the paper unlike all the other bars. I was really hesitant to add this one to my list or try it because of the smell, but I decided to give it a try. While I could smell the scent, it didn’t last for very long in the bathroom. It felt similar with the Lush bar as I didn’t need to make a huge lather just to get enough shampoo out of it. The scent smelled a lot better in the bathroom, but quickly went away and it just smelled like your average shampoo. My hair was a bit squeaky, but not as much as it was with the Lush bar. After drying out my bar, the smell wasn’t as strong as before. For its price, it keeps your hair clean, but it’s not really my favorite scent. 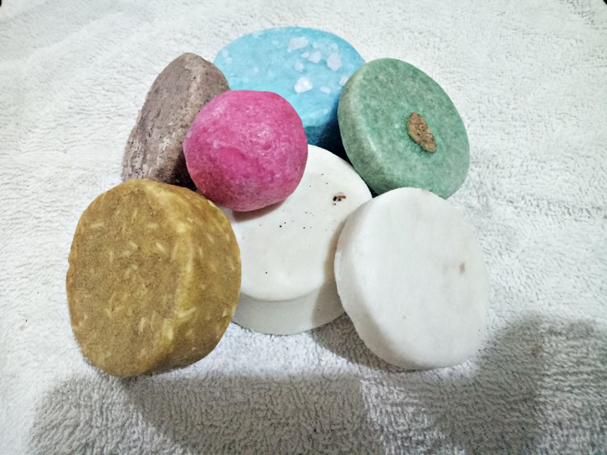 If you happen to be from Visayas and are looking for affordable shampoo bars that are not only made of organic ingredients and are paraben- and EDTA-free, then head on over to their Shopee page to check out the other scents the shop has. 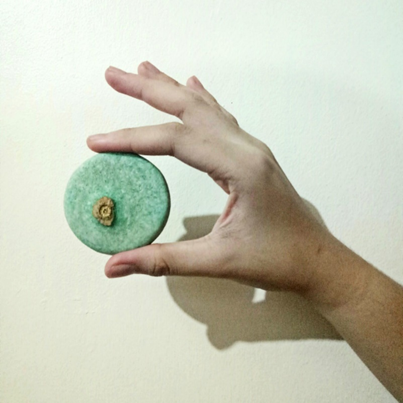 Another find from Shopee, Simply Green and Natural sold Mayumi Organic Shampoo Bars in various scents. Its strongest point was that these shampoo bars had more to offer than the other two bars I bought on the site. It advertised dandruff control, anti-drying effects, and worked as both shampoo and conditioner. It also sold some of the scents in smaller amounts, great for people like me who want to try the shampoo bar trend first before spending more. I bought the small rose one. A regular bar got about 20 washes, so I assume this will get me much less than that. It was packaged in small wax paper and, for some reason, came with a pack of stevia. Aside from the Lush bar, it was the only one that had something inside of it other than the shampoo ingredients. The smell was flowery, but not one that reminded me of a rose. Despite its size, it worked well enough that I could wash my hair with it. There wasn’t enough lather to put, so I had to scrub the bar on my hair, which was a bit difficult given its shape. After bathing, my hair didn’t really smell like anything other than the average after-shower smell, but it was slightly squeaky. At that point I realized the squeaky, waxy-ness may have to do with the sulfates or the shampoo-conditioner effect, since only Lingap advertised as a sulfate-free shampoo and was the only one that didn’t claim to be a shampoo-conditioner. Also, the flowery scent I smelled when I got the bar didn’t really smell as strong after the first wash.
Based on my experience with the other shampoo bars, I wouldn’t buy a bigger shampoo bar here for long-term use. I would, however, recommend this place to people who want to try out the trend, as it is the only place that offers the smallest size of shampoo bars. Shopee seller “Mkhlmgn” caught my attention by offering handmade shampoo bars sold in gift boxes. But when I learned these cost extra, I decided not to opt for it. Her products come in five scents, are paraben-free, have aloe vera extract, anti-dandruff properties, and a mild conditioning effect. One shampoo bar should supposedly give you up to 60 washes, the regular amount as I found out. I got the bare vanilla bar thinking that, if the scent stuck to my hair, it would complement the vanilla-scented perfume I wear every day. It came covered in one layer of wax paper and another paper bag layer. Whereas all the other bars were dry when I first touched them, this one had a very slimy texture, almost like there was already shampoo stuck to my hand. It’s also the only bar with a lot of visible sulfates. 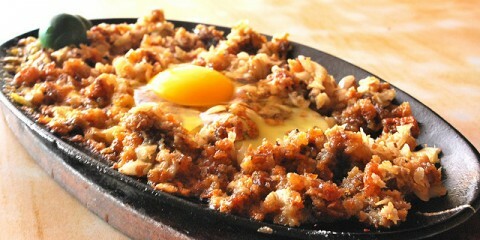 If you look at the picture, you can see it has a lot of white rice-like substances. A few of the other bars have sulfates, but it isn’t that visible and is often colored or blended into the shampoo bar that you can barely see them. The shampoo bar continued to feel a bit stickier than the others even while showering. It was also slightly softer than the others. But the smell wasn’t overpowering and continued to stay on the bar even after drying. The only downside was that although I liked the scent on the bar, I didn’t really get to smell it on my hair. Overall, it’s a pretty good shampoo bar. It’s the only bar I found on Shopee sold in boxes which can be great for giving out eco-friendly gifts. Just don’t be turned off by its unusual texture. The main point of switching from regular bottled shampoos to shampoo bars (and even conditioner bars) is that you’re reducing the amount of plastic bottles and sachets you’re throwing away. I read a Twitter post the other day that we can’t really blame the poor for using sachets that cause so much plastic waste because that’s all they can afford. 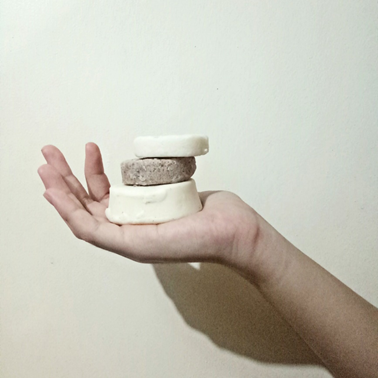 But if businesses could make shampoo bars affordable for everyone and last longer than your average bottle of shampoo, then it could be possible to reduce the overall waste Filipinos create in a day without sacrificing personal hygiene. 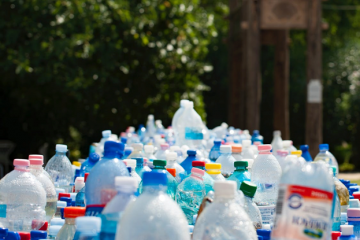 When there are about nine million tons of plastic thrown into the ocean every year, it’s hard to deny the fact that we have a plastic problem. Buying a shampoo bar won’t get rid of the bottles and sachets that are already in our landfills, but it can greatly reduce the amount of plastic we add to it in the present and future. If you’re considering buying shampoo bars, remember that some brands can work for you and improve your hair while others do not yield the same results on other people. I might not have liked the squeaky hair feeling some of the shampoo bars I tried out created, but these bars may have been a hit with other customers. This also applies to regular shampoos. So if you’re thinking about buying shampoo bars online or from a zero waste store you know, expect that you might have to look around the market a bit to find the right one that works for you. 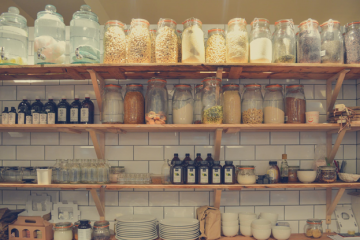 But if you’re looking for total zero waste living, then this method isn’t it for you. While compiling my shampoo bars to take photos for this article, I noticed how much plastic I was wasting. 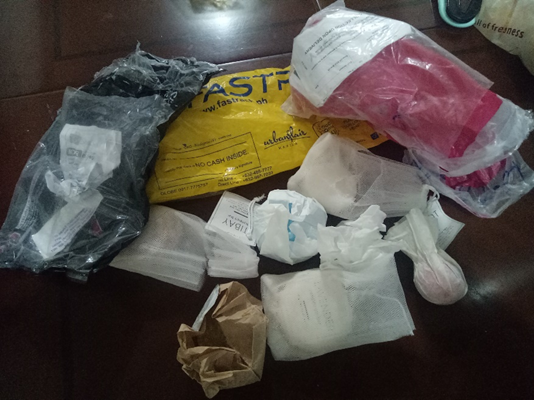 Because my orders came from different sellers, they all arrived separately, thus the extra plastic waste. My parents have taught me to save plastic bags if they can be reused, but I didn’t really know another purpose for these courier bags, so I threw them away. 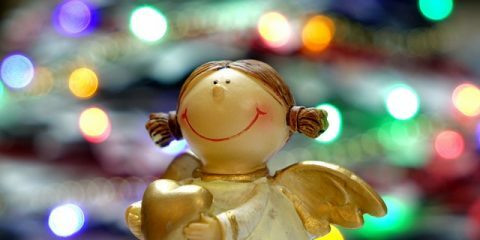 If you choose not to buy the tin cans or gift boxes provided, you’re stuck with paper. They’re biodegradable compared to plastic packaging, but it’s still waste, as they eventually got wet and couldn’t be reused. Don’t get me wrong: shampoo bars are a good idea for baby steps leading toward a greener lifestyle, but it’s not zero waste as marketers and advertisers would make you believe. Even with shampoo bars, you’re not going to be totally zero waste. I’ve seen videos of people trying to achieve that (one girl in the US can fit two years of the trash she created inside one mason jar), but even then, there is some amount of waste being produced. Environmental trends, such as reusable straws and shampoo bars, are a great way to reduce the waste you create long-term, but they’re baby steps compared to what can be done to actually create a bump in the amount of waste produced every year. Based on this experiment, I actually would consider switching to shampoo bars, and based on what I’ve experienced trying out these bars, I know what kind of bar I need for my hair type.